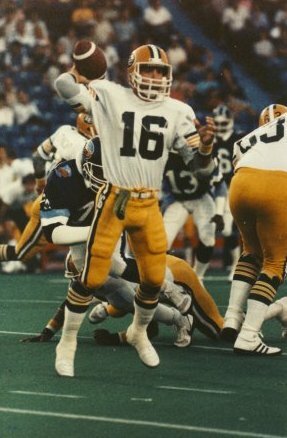 Matt Dunigan is a graduate of Louisiana Tech and joined the Edmonton Eskimos as quarterback in 1983. After a year on the sidelines, Dunigan guided the team for the next four seasons, leading them to two Grey Cup games. In 1988, Dunigan was part of a six for one trade that sent him to the BC Lions and immediately led them to the Grey Cup. He was the league’s passing leader in 1989 and then was part of another six for one trade that sent him to the Toronto Argonauts. In his first year he guided them to 689 points or 38.3 points per game and followed with a Grey Cup victory in 1991. Dunigan became a free agent in 1992 and joined the Winnipeg Blue Bombers, guiding them to two Grey Cup appearances. In 1995, the expansion Birmingham Barracudas signed Dunigan as a free agent. There he set career bests with 362 completions on 643 attempts for 4,911 yards and 34 touchdown passes. In 1996, he signed with the Hamilton Tiger-Cats, the final stop in his 14-year career. Over his career he rushed 850 times for 5,031 yards and 77 touchdowns. When Dunigan retired he was second in all-time passing statistics (3,057 completions in 5,476 attempts for 43,857 yards and 306 touchdown passes) and held the record for most passing yards in a game (713 yards).